I've been holding on to this recipe for quite some time now and for a really odd reason. I just kept misplacing the handwritten recipe paper. Yeah I feel like I'm addlebrained at times but you have to understand that I've moved, twice, in the past 2 years (and we're moving again soon) and stuff always gets misplaced when that happens. In the meantime I cooked this recipe every time I found the recipe card for it and then promptly misplaced it again. Well I finally found it again and decided to cook it last night for dinner. Usually I have a side of mashed potatoes and some sort of vegetable with it and my wife loves it. 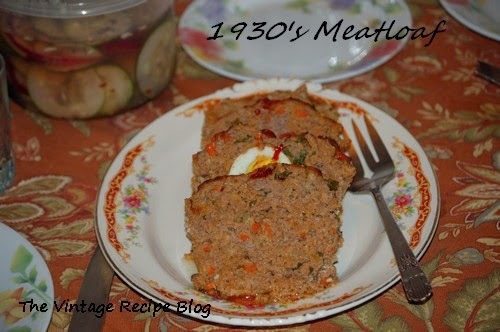 Try it with some Southern Cucumber Relish and the vinegary sweetness balances out the rich taste of the meatloaf.